This detailed review of the Thermolon ceramic coated 11-inch frypan provides an overview of the product details, its performance in use, and some overall impressions of this pan. Use this as a guide to determine if this is the right non-stick pan for you and your kitchen. You can tell at first glance that the GreenPan Thermolon non-stick coating is a step above other non-stick pans. It feels very solid in your hands. While it would be helpful to initially try this frypan without any oil, the specs that came with the pan suggested using a little bit of oil. According to the basic rules of nonstick care, you should use a little oil every time the pan is used. Cooking with a little oil or butter is recommended by GreenPan, but, unfortunately, this is not as evident when watching the infomercials, which seem to suggest that oil is optional for flavor. Though some advanced nonstick coatings seem fine at first using no oil to cook with, the coating wears much more quickly. 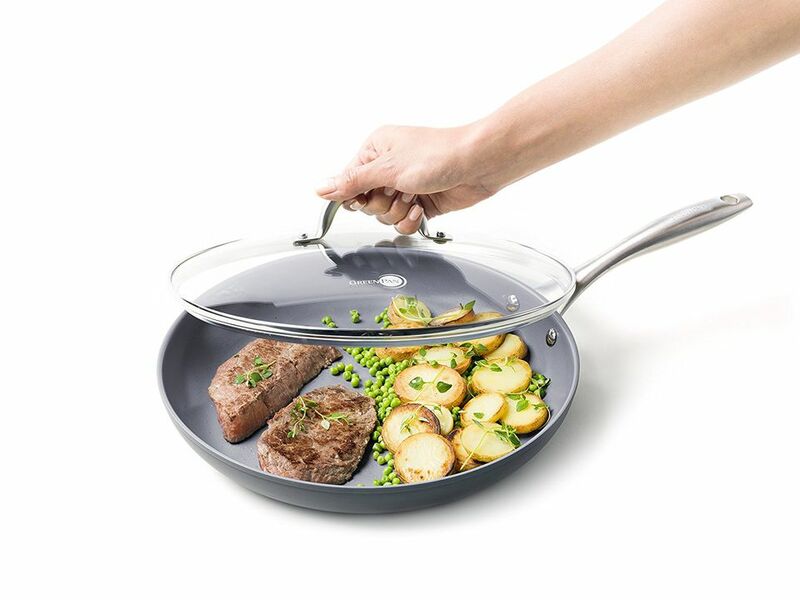 The GreenPan frypan is a joy to cook with. It sears nicely, caramelizes onions well, and cleans up beautifully. Slightly oiled, meats and foods released easily from the pan. As for eggs, pan conditions were slippery and a chase ensued; a little practice is needed to successfully turn eggs over. They slid off to the plate without a problem. The performance is wonderful. There are no hot spots and nice even cooking. The 11-inch pan size leaves ample room for family entrees and one-dish meals. It's nice to know there's no worry of any chemical fumes when this pan is heated. The GreenPan is highly recommended for cooking and clean-up proved to be super quick. As for other notables, it's nice to know this pan is PTFE and PFOA free and there were fewer emissions during the manufacturing process. It's a better choice for those who want green products or safer nonstick frypans and cookware. When it comes to handling, the stainless steel handle is comfortable. During a month of testing, this pan performed better than expected during cooking and did not show any signs of foods sticking or other coating concerns. GreenPan cookware is a little pricier than some other brands, but you do have to consider how the pans are constructed. They are made with a superior nonstick interior and a heavy aluminum base for good cooking performance. When it comes to nonstick, it's the care that dictates how long the coating will last. Regardless of the brand, proper nonstick care is crucial if you want the coating to last. That includes (but is not limited to) using a little oil or butter when cooking (no oil sprays), handwashing rather than dishwashing, and avoiding prolonged high heat temperatures. While cooking, avoid metal or sharp utensils and instead use wood, silicone, or plastic tools.